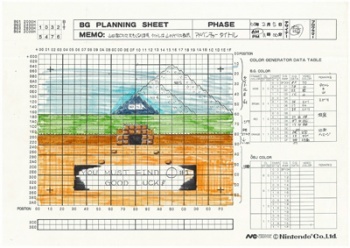 Nintendo has released some hidden pieces of game history: Concept Art for the original NES Legend of Zelda. There are few games that have had quite as big an impact on the gaming landscape as 1986's The Legend of Zelda. A landmark title, it would go on to spawn what is easily one of the most-beloved videogame franchises of all time: Mention Link to the Past or Ocarina of Time to someone who grew up in the age of the SNES, and you'll almost always see their eyes light up in joyful nostalgia. The latest installment of Nintendo's excellent "Iwata Asks" behind-the-scenes series stars Toshihiko Nakago and Takashi Tezuka, who according to Iwata were once known as the "Golden Triangle" with the legendary Shigeru Miyamato back in the day - and helped him create Zelda while working on Super Mario Bros. While the vast majority of the interview is spent talking about the handheld Zelda games, it's at the end that we get a peek into true gaming history: Original concept art for The Legend of Zelda. In the original concept, dated February 1st 1985, the title "Legend of Zelda" didn't yet exist; the game was simply referred to as "Adventure" (or was perhaps being thought of as a game starring Mario). There are some original sketches of enemies, including "Hakkai" - who eventually became Ganon - as well as items, including a bow and arrow, a compass, and a boomerang. And then, of course, there's the original version of the Zelda world map, drawn by Miyamoto and Tezuka - in marker - in one sitting. Quoth Nakago, "And you can see Miyamoto-san's personality. At first he's making individual dots, but as he gets tired of it, toward the top, he just fills in a bunch of space!" It's a cool little look at gaming history here - these modest sketches would eventually become the foundations of one of the most beloved game series of all time. Would you have guessed?